The final Visual Guide update from wave 3 of the Star Wars [Solo] basic figures is the repacked Rey (Jedi Training) figure. Click below to check out our Visual Guide, and click here to read our full review. NEW FIGURES! 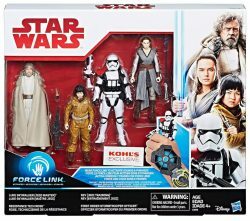 The Star Wars [Solo] Rey (Jedi Training) Force Link 2.0 figure is a complete waste of a slot. She’ll also clog up pegs. Learn more in our Research Droids Reviews today! Be sure to leave your thoughts in our comments section, vote in the poll or even comment about it on our Facebook page. Click the banner below for the direct link to the review! As always, you can also send your review requests via email if you’d like to see something that we didn’t cover yet. Found! Rey (Crait Jedi Training) Hits Toys R Us Brick And Mortar! What’s up with all of these Festivus miracles today? JTA reader Eric S. from Los Angeles CA has found the Toys R Us exclusive Rey (Crait Jedi Training) figure there! They’re hitting folks! Here’s another Star Wars [The Last Jedi] 12-Inch figure added to our Visual Guides. Click below to check out Rey (Jedi Training). Make sure to also read our full review right here. Another scale means another Rey (Jedi Training) figure. Check out the 12-Inch Figure version in our Research Droids Reviews today! Be sure to leave your own thoughts in our comments section, vote in the poll or even leave comments about it on our Facebook page. Click the banner below for the direct link to the review! As always, you can also send your own personal review requests via email if you’d like to see something that we didn’t cover yet. ← Maz Kanata/Elite Praetorian Guard TBS6 Wave At HTS's eBay Store! Rey (Jedi Training) (44) is another repacked The Black Series [Phase III] 6 inch figure, this time with a slightly revised paint job.Click below to check out our full Visual Guide. Click here to check out our full review.